On January 18, 2016, Glenn Frey died of pneumonia at age 67. His son Deacon replaced him in the band the next year. 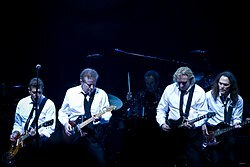 Band not active due to the death of Glenn Frey. This page was last changed on 8 April 2019, at 14:08.